Today you're going to learn all about why you NEED to be using a pool clarifier if your pool is cloudy or full of algae. You know all the benefits of a clear and pristine pool, so it can be dispiriting and frustrating when you just can't get rid of that cloudy pool water. By the end of this guide, you'll know why you should use a pool water clarifier, some reasons your pool might be cloudy, the differences between a flocculant and clarifier, when you should use a clarifier, and my picks for the best pool clarifiers on the market. Why should you use a clarifier? What if your pool is still cloudy after clarifying? Can you make homemade clarifier? It may seem pretty harmless to swim in a cloudy pool, but the truth is it can be hazardous to your health. In fact, according to the Center for Disease Control (CDC), dirty swimming pools can carry bacteria that cause things like diarrhea, rashes and ear infections, to name a few (source). So, needless to say, it’s pretty important to get rid of that junk and improve your water clarity. The Weather. With your pool overflowing with rain often comes pollutants, leaving traces of film or beaten down leaves in your pool. Too Much Chemical. This is why it’s important to check your pool’s pH levels frequently. Too much pool chemical can be just as damaging as too little. (Read: How to lower pH in your pool). Clogged Filter. Or an improperly maintained filter, whether that's a sand filter, DE filter, or cartridge filter. If it’s not doing its job, it’s letting in contaminants. (Read: How to choose the best pool filter). Since we’ve already told you how to clean your pool using a flocculant, you might be wondering what the difference is between that and a clarifier. Simply put, a flocculant clumps together particles and sinks them to the bottom of the pool floor to be vacuumed up and a clarifier clumps them together and leaves them floating on top to be absorbed by the pool’s filter. A flocculant should be used when there is too much debris or algae bloom for a filter to pick up, acting as a filter aid. You can also use it when you have more time on your hands since it will require vacuuming water out of your pool (have some fresh water handy to re-fill it), or you can brush the pool. Balance your pool water. Remember, one of the main reasons your pool could be cloudy is due to chemical imbalance—so be sure to balance your pool water. Be on the lookout for high pH, high alkalinity, and high calcium hardness. Follow the instructions exactly, paying close attention to proper dosage, pool water balance, and how to filter your pool after treatment. Run the filter 24/7. This will definitely help to improve circulation and and filtration. Be sure to keep your water balance and chlorine levels well maintained. If you wish to maintain the sparkly clear blue look of crystal clear water, then you should clarify your pool every week. This will keep smaller particles from growing into larger clumps of bacteria and dead algae that will contaminate your pool and make it look dirty. Used regularly, this step will cut down drastically on the amount of time you will have to spend scrubbing and vacuuming later. If you still have cloudy water after using a clarifier, you may need to do a little deeper cleaning. When was the last time you scrubbed the bottom and sides of your pool to remove built-up gunk? Have you checked to see how well they’re working and if they’re clogged lately? A lot of people make the mistake of continuing to add more clarifier in these situations and that is not usually a good solution. Just like with chemicals, overdosing with clarifier can throw off your pool’s pH balance, making the water murkier than it was before and creating the opposite effect. Check all the other possible culprits before purchasing more chemicals or cleaners. I’ve never been able to find a good home remedy substitute to clarify your pool. At least not one you could use to clear up a pool the way a good clarifier does in such a short amount of time. There are, however, a few cheap and simple solutions for pool chemicals that will work in a pinch to maintain levels in an already clean pool. This method, called the “BBB Method” is a way to stabilize your pool’s chemistry with bleach, baking soda and Borax. To use it properly, you will need to use your testing kit to check levels, then you can raise the pH by adding Borax, the total alkalinity by adding baking soda and the chlorine by adding—you guessed it—good old-fashioned bleach. Knowing how and when to use a clarifier is only half the battle. With so many products out there, how in the world are you supposed to know which one to buy? Super Blue gets our vote because it’s fairly-priced, works fast and is easy to use. It’s also super-concentrated. You can clarify 5,000 gallons of water with one tiny ounce! 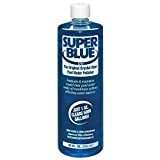 Super Blue is a clean non-toxic liquid that won’t clog your sand filter, and it not only cleans up a murky pool, it also helps prevent future outbreaks of the grime that causes it. Some folks have raved that they could see results with the product in less than a few hours and that they got results with it where other products failed. Clorox is a well-known brand people trust and their clarifier product is no different. Just like the other clarifiers listed here, this one will treat 5,000 gallons of water with one ounce and is liquid concentrated for economic value. A lot of people like it because it works just as well as the other big-name pool products for a fraction of the price. We also love how easy it is to use and how quickly you see results. Another super-concentrated liquid clarifier, HTH Clarifier also treats around 5,000 gallons of water with one ounce. It’s non-toxic so you can swim soon after its added to your water and it’s specifically made not to affect your pool’s pH balance. We love that it's such a great value, its fast-working power and ease of use. 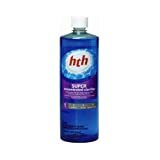 HTH Clarifier is great when you need a mile and inexpensive product for frequent use. It’s also readily available at most big retailers and big-box pool stores. 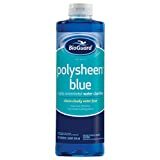 BioGuard Polysheen Blue is another highly-concentrated product that a lot of pool owners love. Many pool owners say it gives them a crystal clear pool super fast and has their pools shimmer like diamonds and remain fog-free. This clarifier is another great choice as it offers the same concentrated cleaning power of one ounce to every 5,000 gallons of water for a great value. Getting and keeping those crystal blue waters you like to see in a pool doesn’t have to be hard. Sure, you will have to do some work once in awhile to keep the filters cleaned and debris out of the way, but using a good swimming pool clarifier once a week can make a huge difference in the way your pool looks and feels. Not to mention, the bacterial infections and illnesses you might be saving your family from!